Declines in loggerhead populations due to directed harvest and incidental take in fisheries along with the ongoing problem of nesting habitat degradation led the National Marine Fisheries Service (NMFS) to propose listing the loggerhead sea turtle as threatened under the Endangered Species Act (ESA). The listing was passed in 1978. In the same year, NMFS proposed critical habitat for this species, but the rule was never finalized. 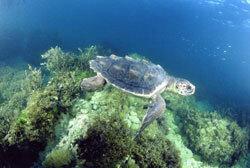 In 1996, NMFS completed a status review for all sea turtles listed under the ESA. In 2007, NMFS completed a 5-year review for the species and was petitioned to reclassify certain populations of loggerhead as endangered. In 2009, NMFS completed another status review for the loggerhead and in 2010 proposed listing the South Atlantic and Southwest Indian Ocean populations as threatened and the Mediterranean Sea, North Indian Ocean, North Pacific, Northeast Atlantic, Northwest Atlantic, South Pacific, and Southeast Indo-Pacific populations as endangered. The proposed 2010 listings were finalized in 2011. For general information on Loggerhead Sea Turtle, see the Loggerhead Sea Turtle species profile page.